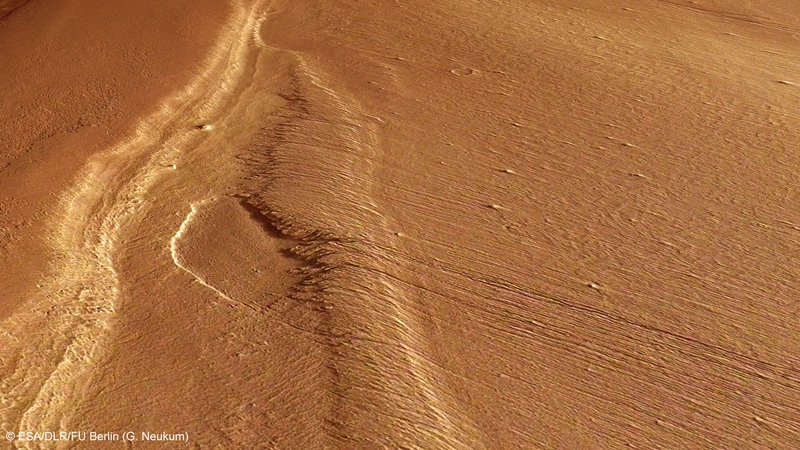 The northern hemisphere of Mars is a single, massive lowland with only a few distinctive landscape features. Frequent, intense dust and sand storms are recurrent here over the course of the seasons. When this happens, the wind transports very small particles, which are either deposited in other locations, or, if they encounter rock, leave their mark through the effects of erosion. This type of wind erosion is also referred to as aeolian corrasion. Besides the extensive dune fields, wind-carved structures called yardangs, which are in line with the direction of the prevailing wind, are the most striking legacy of the power of the winds on Mars. The High Resolution Stereo Camera (HRSC), operated by the German Aerospace Center (Deutsches Zentrum für Luft- und Raumfahrt; DLR), on board ESA's Mars Express spacecraft acquired the images presented here, which show yardangs on the plains around the Gordii Dorsum escarpment. Despite the thin nature of the Martian atmosphere, the wind and dust particles in it have been a frequent – but usually unwelcome – companion of scientists since Mars was first investigated with telescopes and spacecraft. For example, when the US Mariner 9 spacecraft reached Mars in November 1971, becoming the first man-made object to orbit another planet, hopes were high when the first images were radioed back to Earth. But they were a disappointment – nothing was visible in them. At first, the engineers thought there had been a malfunction in the camera system; they later came to realise that the entire planet had been affected by a global dust storm. It took several weeks before the atmosphere cleared and the camera was able to acquire the first clear images of the Martian surface and return them to Earth. This marked the beginning of Mars exploration in the Space Age. The European Mars Express spacecraft has also often had to struggle with instrument operations being restricted by dust storms during the course of its nearly 10-year mission (the orbiter was launched on 2 June 2003; Mars Express has been in orbit around the planet since 25 December 2003). Images acquired by the HRSC camera system during such storm periods are largely unusable. Despite such problems, the HRSC has imaged almost 90 percent of Mars – and some two thirds of the surface in high resolution, colour and 3D. When Mars Express flew over Mars along longitude 217 degrees on 15 January 2013 during orbit 11503, excellent atmospheric conditions were prevalent at the equator. It was during this orbit that the images presented here were acquired, showing a portion of the Gordii Dorsum promontory (the 'Ridge of Gordium' – Gordium was the capital city of the kingdom of Phrygia, lying on the Sakarya river to the west of Ankara). The resolution of the images is about 19 metres per pixel. 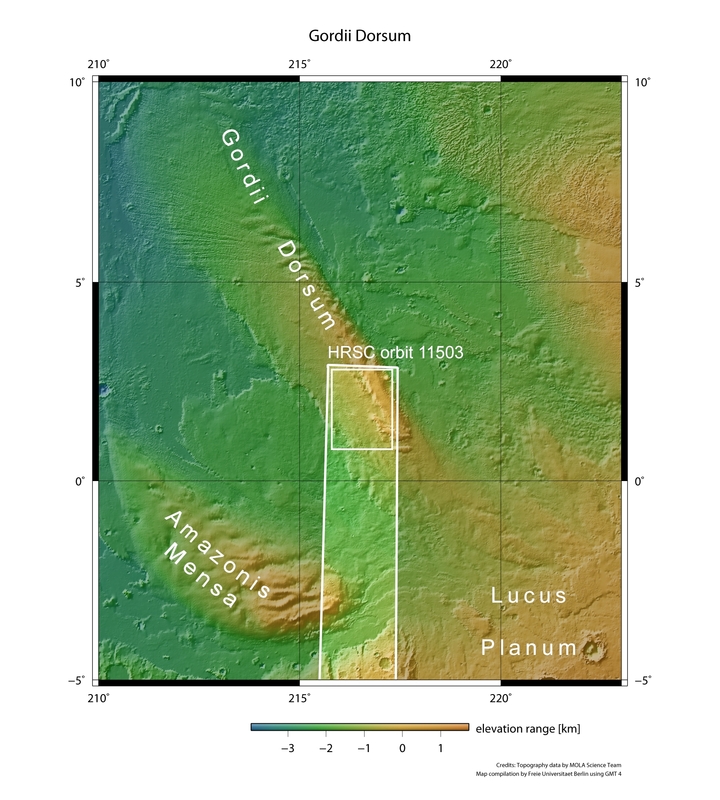 Gordii Dorsum is a 500-kilometre-long range of hills lying some 1000 kilometres southwest of the giant volcano Olympus Mons. Gordii Dorsum is just one of several ranges that extend from the southern Martian highlands in a northwesterly direction into the northern plains. It is thought that tectonic processes created these ranges, possibly by causing strike-slip faults. The images presented here show just a part of the south of Gordii Dorsum. 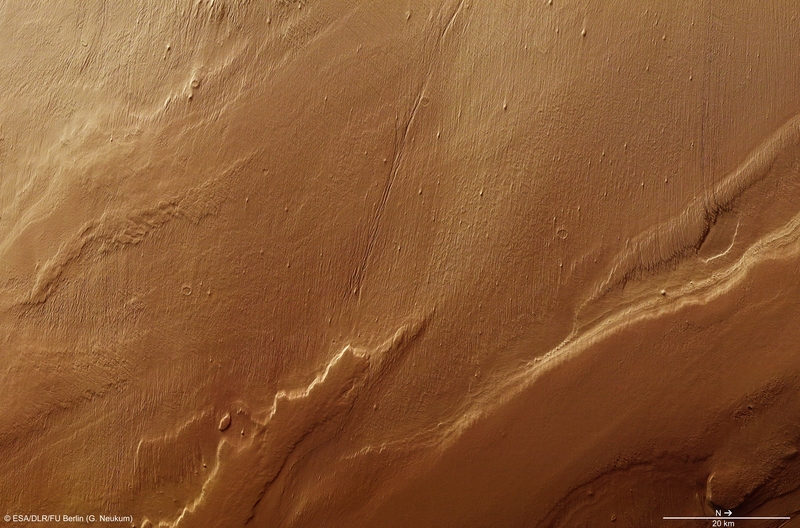 Numerous, narrow crests and furrows running in parallel over many kilometres are particularly noteworthy; these can be seen in the upper part of the plan views (west of the Dorsum). These are yardangs, which were carved out of the rock by dust and sand particles travelling in the direction of the prevailing wind. Clearly the wind in this region generally blew parallel to the Equator for very long periods. This particular type of terrain is also seen on images of regions Aeolis Mensae and Arabia Terra and the territory Eumenides Dorsum. The unusual term 'yardang' comes from the language of the Uyghurs; it was picked up by Swedish explorer Sven Hedin and later adopted in geographical language after Hedin had seen such wind-carved structures in the Lop Nor desert during his second Asian expedition. In addition, a conspicuous line can be seen running across the plain in the upper part of the images. This is probably a major tectonic fault, which continues in a northwesterly direction outside of the images. 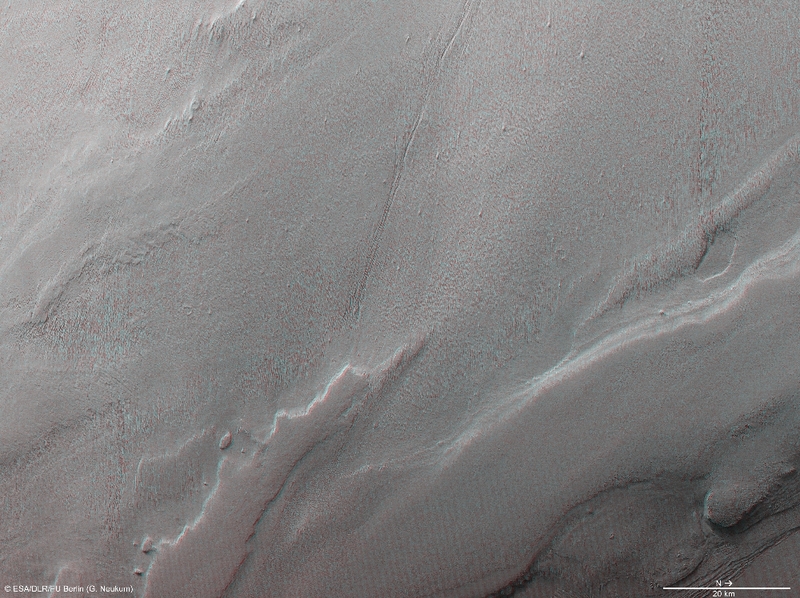 In the perspective views (1 and 6), the topographic image map (3) and the anaglyph image (5), it is readily apparent that Gordii Dorsum is constructed from numerous superimposed layers that have been gradually affected by wind erosion, primarily in the west. 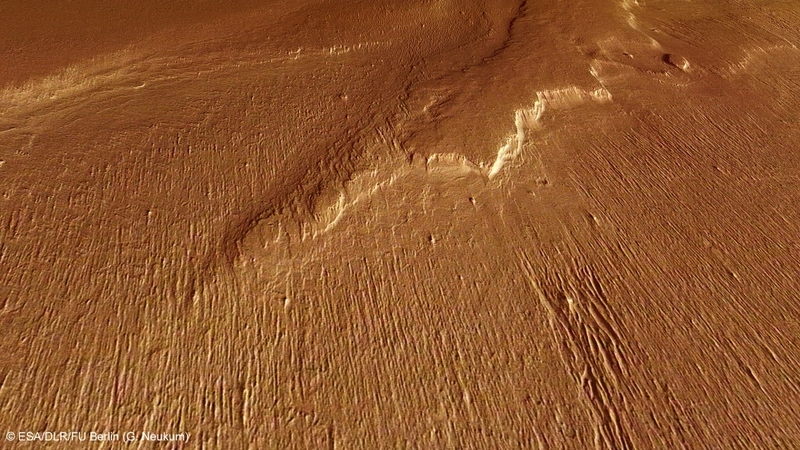 The images were acquired by the HRSC during Mars Express Orbit 11503. The image resolution is 19 metres per pixel. The colour image (4) was captured using the nadir channel, which is directed vertically down onto the surface of Mars, and the colour channels of the HRSC; the perspective oblique views (1 and 6) were computed from data acquired by the HRSC stereo channels. The anaglyph image (5), which creates a three-dimensional impression of the landscape when viewed with red/blue or red/green glasses, was derived from the nadir channel and one stereo channel. 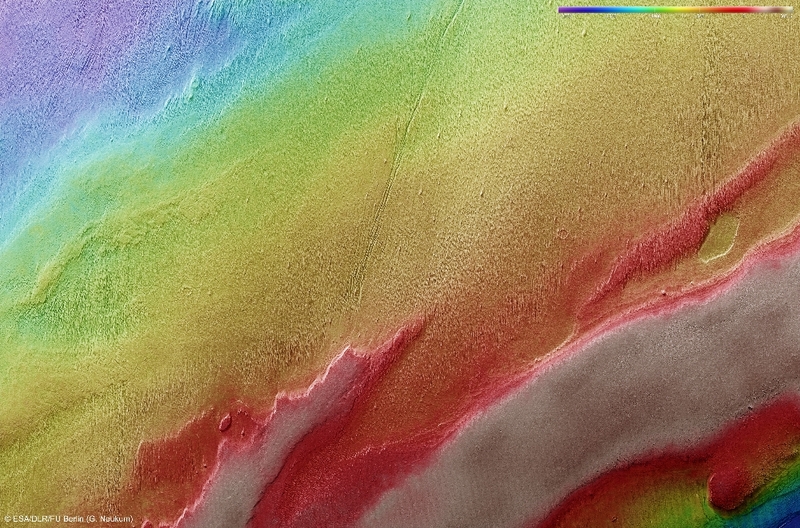 The aerial view, encoded in rainbow colours (3), is based on a digital terrain model of the region, from which the topography of the landscape can be derived.